When I joined Localytics as a product marketer last month I dove right into getting to know our customers and product really well. I spent my first month doing research, listening to customer calls, creating practice campaigns, and reading documentation. While I’m not an expert yet, I picked up a ton from observing my smart teammates and our most savvy customers. So, on behalf of other mobile marketing newbies, I want to share what I’ve learned so far and offer some mobile strategy examples from the pros who use Localytics. The first things I learned at Localytics were the basics of mobile marketing. Personalization is key. Creating an intuitive mobile experience supported by personalized messaging campaigns can make all the difference between your users churning or becoming a valuable customer. Using a mobile app as a standalone channel doesn’t work. 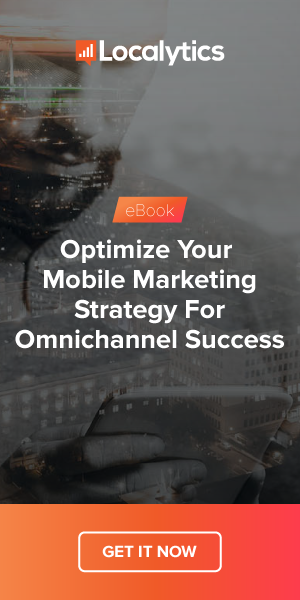 Having your app fully integrated with your other marketing channels and creating a consistent brand experience across them is critical for getting full return on your mobile investment. Vanity metrics aren’t KPIs. Number of downloads aren’t all that meaningful. Mobile marketers need to focus on whether users are opening the app on a regular basis and performing valuable actions (making purchases, consuming content, etc) during those sessions. Once I understood the basics, I looked at more advanced ways our customers leverage our product to engage, retain, and convert their mobile app users. Key value pairs give you the ability to leverage user profile data to inform and personalize your messaging. The coolest way I saw this used was in a customized integration of the Localytics Inbox. One of our customers worked with their dev team to create a unique, modern design for their app inbox. As part of this redesign they took their use of key value pairs to the next level. This company worked with their design and dev team to come up with the key value pairs that its marketing team could use. Now, when the marketing team goes into Localytics to update inbox messages with new content and creative, they don’t need help from developers. And when users open the app, they’re presented with content tailored to their interests. They can also see personalized badges for their accomplishments! Many of our customers have become master experimenters. In most cases, that means using our creative builder to test up to 10 different message variants. By testing regularly our most successful customers have increased revenue by up to 20%. One of our more advanced customers took it a step further by using a message that has performed well and sending it to a series of separate audiences. This allows them to get in front of different groups of users with a message they’re confident in and learn more about the preferences and behaviors of each audience. Audiences in Localytics is awesome because it allow you to target very specific segments of your app users. You can get hyper-targeted by combining demographic data with in-app behaviors. Some of our customers have their audiences down to a science. I was particularly impressed with the way date-based audiences are used to craft delightful messages. By creating an audience based around account creation date or the anniversary of the user taking an important action you can create campaigns that are scheduled to celebrate those milestones and provide a positive brand touch. You can also create more practical reminders about bill dates and renewals using the same type of dates criteria. With date-based audiences, you’re able to create recurring campaigns you can practically set and forget. The first month at any new job can feel a lot like drinking from a firehose. But by learning the basics and grabbing inspiration from some great customers that are crushing mobile marketing, I’ve come a long way in a short amount of time. That said, I still have a lot to learn so I’d love to hear from you! Let me know in the comments if you’re using Localytics in an interesting way or if there are any cool tips and tricks you’ve picked up that everyone should know.